The New Orleans Health Department is trying to make it safer for children to get to school by teaching them about street safety, providing stipends to hire crossing guards and adding equipment like crosswalk signals. The program will target 14 schools. It’s funded by a nearly $650,000 Safe Routes to School grant from the state department of transportation, city spokeswoman Erin Burns said. Work will begin this summer. The project will have a special focus on South Claiborne Avenue, a six-lane U.S. highway with heavy rush-hour traffic. The health department will conduct a comprehensive analysis of four schools near Claiborne and between Napoleon Avenue and Earhart Boulevard. 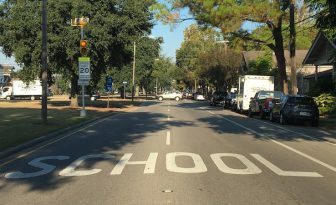 School zones throughout the city require drivers to slow to 20 mph every morning and afternoon that school is in session. Some of those zones are marked with flashing lights. Until recently, many of those lights were broken. When The Lens first surveyed every light in the city in January 2015, only two in five worked properly. This spring, four in five lights worked, the most we’ve seen. The improvement coincided with the city’s expansion of traffic cameras, which issue tickets to drivers who speed and run red lights. Most of the new cameras will be in school zones. In recent years, the city has also installed high-visibility pedestrian crossings near schools on South Carrollton Avenue and other city arteries. Meg Young, program coordinator for Crescent City Crossings, told Orleans Parish School Board members about the initiative earlier this month. “School-age children are the most vulnerable people on our roadways,” Young said. The health department is working with about a quarter of the city’s 80-some public schools. In addition to the 14 served through this grant, seven more have secured their own grants. Board member Nolan Marshall Jr. applauded the program. He recalled the death of a 6-year-old boy who was crossing Paris Avenue on the way to his bus stop in 2014. In response, Marshall and City Councilwoman LaToya Cantrell created a working group to deal with school transportation safety. Marshall said he’s grateful for Crescent City Crossings’ work, which includes training physical education teachers on how to teach kids about bicycle safety. But he said more should be done to teach students about street safety, and he asked Young to tell the board how much it would cost to do it for every student in the city. Through Crescent City Crossings, the city will train gym teachers at 10 schools how to teach students street safety. The health department also will provide stipends to those 10 schools to hire crossing guards, Burns said. * Each school will get $2,000 per guard. The guards must pass background checks and participate in training sessions run by the police department. The health department and police department will check in with them monthly. The city is also making a concerted effort to address safety on Claiborne. This summer, the health department will start safety studies for four elementary schools near Claiborne: Andrew H. Wilson Charter School in Broadmoor, Lawrence D. Crocker College Prep in Milan, KIPP Central City Primary, and Sylvanie Williams College Prep, also in Central City. Burns said roughly 2,200 kids attend those four schools. Young conducts walking safety audits, where she walks with children on the route they take to school to check for missing signs or other hazards. With input from the Department of Public Works, the city issues safety reports with recommendations on how fix problems. Improvements would be funded by the grant. That “could include installing signage, adding high-visibility crosswalk signals, and replacing sidewalks,” Burns said in an email to The Lens. Burns said the program will work to ensure schools have clear policies regarding student arrival and dismissal. Those policies will include all the ways children get to school: buses, carpools, walking and biking. Young told the school board earlier this month that one school, which she didn’t name, didn’t distribute a policy for arrival and dismissal last year.